The Culligan RFC-BBS Water Filters produce healthier, better-tasting drinking water. They provide effective chlorine taste & odor reduction (based on manufacturer's internal testing). The Culligan RFC-BB unique design reduces carbon fines in filtered water. 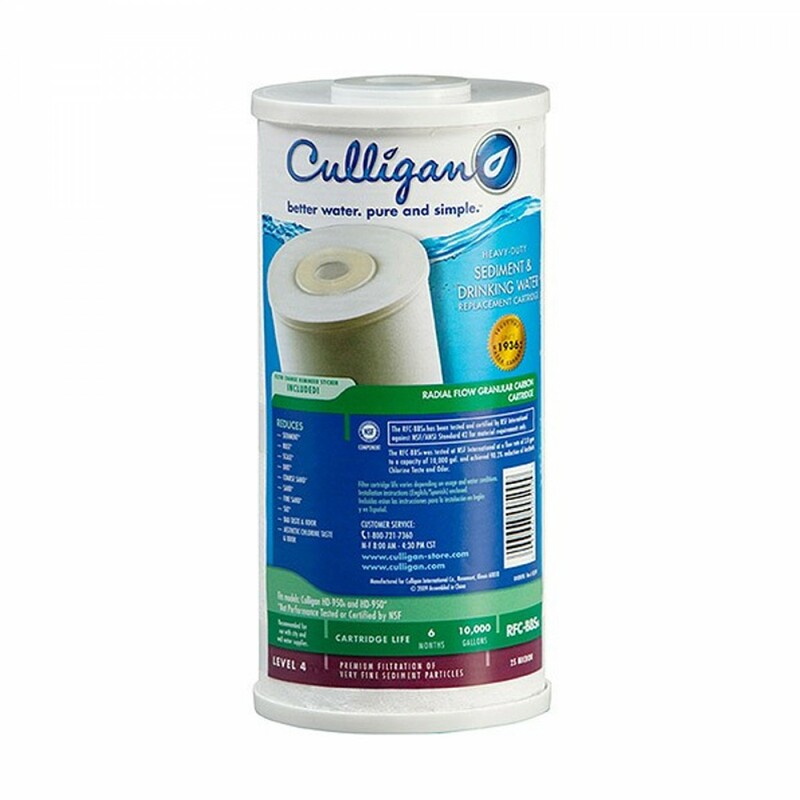 Culligan RFC-BB cartridges are constructed with a 70 micron porous polyethylene outer shell and durable polypropylene end caps. The 2-3/4-inch OD cartridges have a polypropylene core and the 4-1/2-inch OD cartridges incorporate a spun polypropylene core. Sandwiched between the outer shell and the core is a bed of granular activated carbon (GAC). The Culligan RFC-BB replacement cartridge unique radial flow design offers the benefits of granular activated carbon (GAC) filtration, such as low pressure drop, while at the same time significantly reducing the release of carbon fines commonly associated with GAC style cartridges. NOTE: The granular activated carbon cartridges will contain a very small amount of carbon fines (very fine black powder). After installation, a new cartridge should be flushed with sufficient water to remove all traces of the fines from your water system before using the water. Each time you use your filtered water tap for drinking or cooking purposes it is recommended that you run (flush) the tap for at least 20 seconds prior to using water. This is particularly important if the water tap has not been used daily. Do not use with water that is microbiologically unsafe or of unknown quality without adequate disinfection before or after the system. 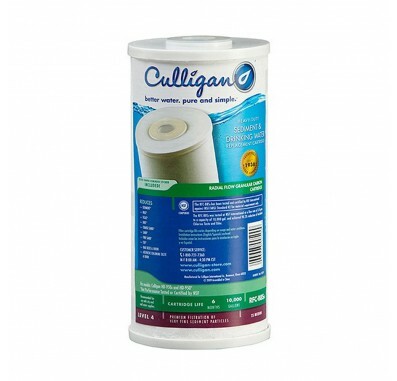 155141 Culligan RFC-BB filter fits in housings for 10 inch Big Blue water filters.